Expedition 45 crewmembers Oleg Kononenko, Kimiya Yui, and Kjell Lindgren have completed their journey home to Earth on the Soyuz TMA-17M spacecraft on Friday morning. 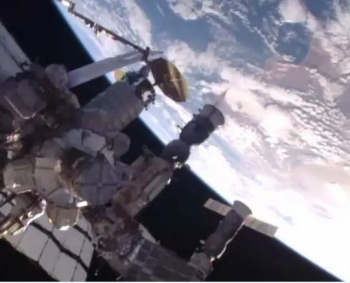 Undocking from the International Space Station (ISS) occurred at 09:47 UTC (4:47 am EST) ahead of a night landing on the Kazakh steppes at around 13:15 UTC (8:15 am EST). The return of the three crew members from Expedition 45 wraps up nearly 143 days in space for Kononenko (RSA), Yui (JAXA), and Lindgren (NASA) since launching from the Baikonur Cosmodrome in Kazakhstan on 22 July 2015 at 21:02:45 UTC. During their time with Expeditions 44 and 45, Kononenko, Yui, and Lindgren worked through a crew rotation in September as well as the deliveries of new supplies to the ISS via the JAXA HTV-5 resupply mission in August and the Progress M-29M mission which launched and docked to the Station on 1 October 2015. Unique to Expedition 44/45 crewmembers Kononenko, Yui, and Lindgren was the lack of U.S. spacecraft at the ISS during almost the entirety of the 143 day duration of their mission. 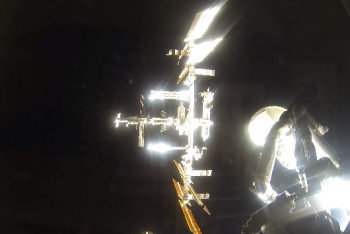 This lack of a U.S. spacecraft resupply visit was broken on 9 December when the Cygnus CRS OA-4 spacecraft from Orbital ATK arrived at the ISS and was grappled by NASA astronaut Kjell Lindgren using the Station’s SSRMS (Space Station Remote Manipulator System) robotic arm. For Expedition 44/45 and TMA-17M, the flights represented the third overall space flight for Oleg Kononenko of the Russian Federal Space Agency, who previously served on Expedition 17 as well as Expedition 30/31. Prior to his selection for the cosmonaut corps, Kononenko worked at the Russian Space Agency’s Central Specialized Design Bureau as an engineer. Kononenko was selected as a cosmonaut candidate on 29 March 1996 and underwent two years of training at the Gagarin Cosmonaut Training Center before he then began training in October 1998 as part of a cosmonaut group selected for the International Space Station Program. He was initially a backup flight engineer for the Soyuz TM-34 mission, the third visiting crew for the ISS and also trained as a primary flight engineer for Expeditions 9 and 11. Kononenko finally undertook his first flight as a flight engineer for the International Space Station launching and landing aboard the Soyuz TMA-12 vehicle as part of Expedition 17 from April to October 2008. He then returned to space on 21 December 2011 and served as a flight engineer of the Expedition 30 crew and Commander of the Expedition 31 crew before returning to Earth on 1 July 2012. Unlike Kononenko, his two fellow Expedition 45 crew members returning to Earth Friday are both concluding their first spaceflight. For Kimiya Yui, the first Japanese candidate for the astronaut corps with a military background, his first space mission comes four years after his completion of astronaut candidate training and certification to serve as an astronaut aboard the ISS. 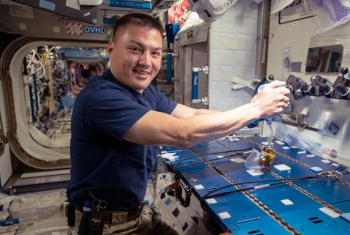 Prior to his selection as a crew member for TMA-17M and Expedition 44/45, Yui served as an aquanaut aboard the Aquarius underwater laboratory for the NEEMO 16 undersea exploration mission in June 2012. For Kjell Lindgren, his journey to space began in June 2009 when he was selected as a member of NASA Astronaut Group 20. Lindgren was born in Taipei, Taiwan in 1973 before moving to the United States after spending most of his childhood in England. Before becoming a NASA astronaut, Lindgren worked at the Johnson Space Center in Houston beginning in 2007 and was the Deputy Crew Surgeon for the STS-130 flight of the shuttle Endeavour in February 2010 as well as for the Expedition 24 crew. Lindgren was then lead spacecraft communicator for Expedition 30 before receiving training at the Gagarin Space Center, which allowed him to serve as part of the backup crew for the Expedition 42/43 and Soyuz TMA-15M missions before receiving his assignment to Expedition 44/45. 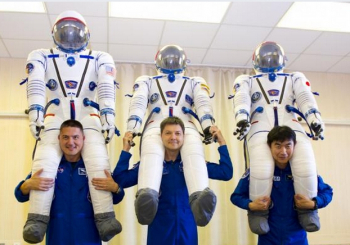 In preparation for the trip home, Kononenko, Yui, and Lindgren donned their Sokol launch and entry suits before bidding farewell to ISS Commander Scott Kelly, and Flight Engineers Mikhail Korniyenko and Sergey Volkov – who will remain on the Station until March 2016. Once final farewells were complete, at approximately 06:00 UTC (1:00 am EST) on Friday, 11 December, hatches between the Soyuz TMA-17M spacecraft and the International Space Station were closed at 06:25 UTC (1:25 am EST). Once inside the Soyuz, the TMA-17M crew closed the hatches between the Orbital Module (BO) and Descent Module (SA) and strapped themselves into their Kazbek couches inside the SA. As per the timeline, Soyuz TMA-17M undocked from the ISS at 09:47 UTC. At the moment of undocking, Expedition 45 will officially came to an end and Expedition 46 began. Following undocking, Soyuz enjoyed a few hours of free flight as it departed from the Station’s neighborhood via two separation burns while Kononenko, Yui, and Lindgren prepared for the final aspect of their mission. The deorbit burn occurred at 12:17 UTC (7:17 am EST) and reduced the Soyuz’s velocity just enough for it to begin the plunge back to Earth. The Soyuz TMA-17M craft then completed the return to terra firma under parachute, landing on the snowy steppes of Kazakhstan at around 13:15 UTC (8:15am EST) for a rare night landing. The exact timing of touchdown, under soft thruster engine firing, was dependent on a number of factors. 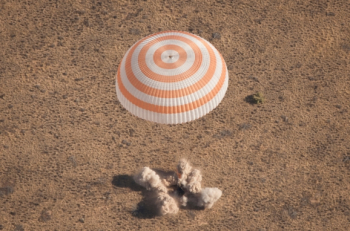 Once TMA-17M was safely back on Earth, Russian, American, and Japanese ground and air crews converged on the Soyuz and extracted the crew from the SA. Kononenko, Yui, and Lindgren then underwent immediate, preliminary health checks once outside their Soyuz spacecraft. Normally they would be transferred to a medical tent to prepare them for transit away from the landing site. However, due to the poor conditions at the landing site the crew were loaded on to MI-8 helicopters and flown to a nearby airfield, where they parted ways for their respective countries and space agencies.